Jupiter, Juno and Minerva were the most important ones, known as the Capitoline Triad. They constituted the cornerstones of Roman religion, pointing to an elementary triple division. The story of the Roman temples reflects the multitude of beliefs in various gods. A crowded pantheon was to be added in the traditional household or family cult of the Dii Familiaris. The household cult became later, in Imperial times, important as a model for the cult of the Genius of the Emperor, paterfamilias of all Romans. Other important gods were Saturnus, Quirinius, Volturnus, Pales, Furrina, Flora, Carmenta, Pomona, Portunus and Fontanus. Special attention is given here to the god Janus, because of his reference to division thinking. Janus (or Ianus) is the god of the (two-fold) beginning, the ‘beginner’ or ‘opener’, the porter of heaven. He had to be consulted whenever a project was started. Gates, doors (ianua) and the morning were sacred to Janus. The opening of the year, in January, still bears his name and gifts were exchanged on New Year’s Day. This pagan habit was later, more or less successful, eradicated from the emerging Christian belief in the first centuries of its appearance. Janus was mostly depicted as a double-headed god, looking back and forwards at the same time (Janus bifrons). The adoration of Janus, in the form of statues and temples, became so excessive during the reign of Emperor Domitian (81 – 96 AD) that critics had enough. However, then a curious change occurred! From the second century AD onwards – the more precise date implied a detailed study of numismatics – the god Janus was depicted with four faces, on account of his presiding over the four seasons. He became then known as Janus quadrifrons. His most famous ‘temple’ was the triumphal arch with four portals, erected in the fourth century AD. (Constantinian times?) at the Forum Boarium (cattle market). The building (arch) will be looked at later in more detail, fig. 452/453. The change from Janus bifrons to a Janus quadrifrons must have taken place somewhere in the early second century AD, which is – in our interpretation of the Roman Empire (see fig. 88) – also the change from the Third to the Fourth Quadrant of the historic visibility. The Romans cared more for the courts of justice and for civil government than for the courts of the temples and religious affairs. Emperor Trajan even left out a temple altogether when building his forum complex, which bore his name. Consequently, while their temples were small, some of their basilicas were grand in size and proportion (like the Basilica Ulpia, which was the largest wood roofed building in the Roman world). Frantic builders like Domitian (emperor from AD 81 – 96) and Trajan (emperor from 98 – 117) can be found in the Third Quadrant. Their activities resulted in the Empire’s historic visibility. The tetradic builders, like Hadrian (ruled from 117 – 130), Antonius Pius (emperor from 138 – 161) and Diocletian (ruled from 285 – 305, including the tetrarchy), are situated in the Fourth Quadrant, which started in 125 AD. The boundary between the extreme attention to Janus bifrons during the reign of Domitian (81 – 96 AD) might be indicative of oppositional thinking at the end of the Third Quadrant. The introduction of Janus quadrifrons on coins, on the other hand, took place in the early second century. It could be an indication of the increasing influence of tetradic thinking at the beginning of the Fourth Quadrant of the Roman cultural period. 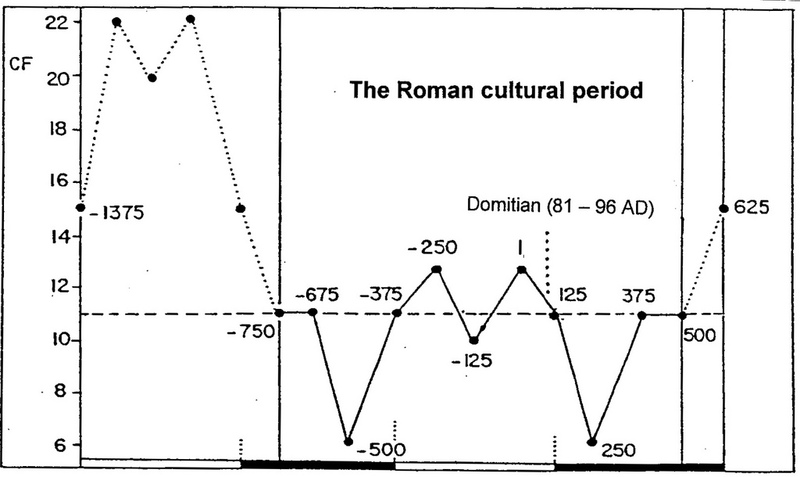 Fig 88 – The communication cycle (CF-graph) of the Roman Empire as seen from a quadralectic point of view. The first visibility is positioned in the year 750 BC, when Rome was founded. The last visibility is given as 500 AD, when the Roman Empire dissolved. The position of Emperor Domitian (81 – 96 AD) is indicated. The history of the temples of the Roman cultural period is probably not as prominent as its civil buildings, but there are a number of hallmarks, which stand out as masterpieces. The choices, which are made here, are – once again – eclectic and do not aim to cover the whole field of Roman temple building. At best, it can give a glimpse of the various possibilities and intentions of Roman religious architecture and put the reader on the trail to further discoveries and relevant examples. The main features of quadralectic architecture, the circular and square, will be followed in the same way as was done in Greek temple architecture. It is known, that the Romans borrowed heavily from their architectural achievements, but it would be too simple to discredit the Romans for their lack of originality. It is – within a quadralectic outlook – a given fact that similar ideas and the subsequent creative solutions develop in any interaction between the architect/builder and the material regardless of time and place. The temporal place of a certain type of architectonic awareness is closely related to the position of an observer within the cultural entity. Roman architects found themselves at some stage of their development in the same frame of division thinking as their Greek counterparts did some centuries earlier. Or, to say it more popular: Emperor Augustus, living during the birth of Christ, had a similar psychological setting as the Greek ruler Pericles some four hundred and fifty years earlier. Their supporting architects, Vitruvius and Callicrates, must have had much in common. To draw the lines between similar results of analogous (division) thinking is one of the objectives of this book. One of the oldest round temples within the Roman cultural period is the Temple of Vesta in the Forum Romanum. It was built around 550 BC during the reign of the royal house of the Tarquins (fig. 89). The cult of Vesta was earlier established by the second king of Rome, Numa Pompilius. Vesta (‘estia’ meaning ‘stove’) was the goddess of the hearth-fire and the Vestal Virgins were the keepers of the holy fire, the symbol of life of the city. Fig. 89 – The Temple of the Vestal Virgins in Rome is one of the oldest round temple structures, predating even its Greek counterparts. The temple was thoroughly renovated around 204 AD. The present columns (of a total of twenty) were erected in 1930. The temple was rebuilt many times. The original building was possibly destroyed during the sack of Rome by the Gaul around 390 BC. Further destruction took place in 14 BC and in the Great Fire of AD 64, but every time restoration followed. The most notable restructuring took place around 204 AD by Julia Domna, the wife of Septimus Severus, after the building was saved from another fire in 191. The imperial temple was made of white marble and a base of three steps that led up to the podium. The peripteros had twenty Corinthian columns. Eventually, the temple was closed in 394 on the orders of Theodosius (Edict of Theodosius). A tholos-type of temple also featured in another ‘Temple of Vesta’ (Aedes Vestae), on the Forum Boarium (cattle market) in Rome (fig. 90). Hermodoros of Salamis possibly designed the open temple in the late second century BC. It was one of the first examples of marble architecture in Rome. It comprised of twenty columns (of which nineteen are still present) and was the temple of Hercules Victor. In the Middle Ages, it was known as the Church of S. Stefano delle Carozze. At one stage of its history, it was erroneously called the Temple of Vesta and is now also referred to as the S. Maria del Sole. Fig. 90 – The ‘Temple of Vesta’ (Aedes Vestae) on the Forum Boarium dated from the end of the second century BC. A third ‘Temple of Vesta’ existed in Tivoli, east of Rome. This round building had eighteen (Corinthian) columns, and is somewhat younger (83 – 79 BC) than the Temple of Vesta on the Forum Boarium. The cement cella of this circular temple in Tivoli had two windows (fig. 91). Fig. 91 – The temple of Vesta in Tivoli continued the tradition of round temples within the Roman cultural period when it was built around 80 BC. A life of temperance or moderation and propriety. These prerequisites for a healthy society follow the interpretation of the quadrants in a quadralectic outlook. The virtues can be considered as different points of view in an ongoing communication. The individual act of contemplation (1) – being an exercise in the handling of ideas – is, in essence, a Second Quadrant activity. However, Cicero’s emphasis on the outcome of this activity in the form of Wisdom (singular) points to a position in the First Quadrant (or the first quarter of the Second Quadrant). Cicero noted that (private) salvation could only be realized in corporate life. He implied an inherent ‘multiplicity’ of the unity of the First Quadrant. There is no actual reference to an Upper Being (God) in this part of the communication, but Cicero made it clear that religion was the most important entity within the context of duties. The demands of religion should come first, then the desire of patriotism, thirdly the usefulness of domestic obligations and, finally, the remaining obligations of civilized man. He disliked the Epicurean philosophy, which had an atheistic outlook and advocated a rejection of public life, and seriously misrepresented its teaching as a shameless pursuit of pleasures. The well-known Epicurean Lucretius – the creator of the poem ‘On the Nature of Things’ – was a contemporary with Cicero at Rome and may have known him personally. Justice (2) was seen as the basis of human relationships and – like a true Roman virtue – received a fuller treatment than the contemplative ideal. The complex field of justice can be placed in a Second Quadrant environment, being an offshoot of human ideas (or how to live and run a society). The basis lies in good faith and fidelity to the engagements. An understanding of the type of division environment – and the actions taken accordingly – should be added in a modern interpretation. These values were well known in the Third Quadrant of the Roman cultural period (lasting from 375 BC – 125 AD). It seems that the discussion of ethic sentiments (by Cicero and other rhetoricians) was a genuine effort to make feelings visible by putting them on paper. The architects, in the meantime, being aware of the same sentiments, recreated these moral ideas in stone. Building and the art of writing have their intention to visualize thought in common and provide a mental shelter in the meantime. Rome started in the last quarter of the first century BC with a serious building program, which is nearly unsurpassed in the history of mankind. Its inspiration and search for identity were born the will to visualize power and control, but its philosophical background was found – possibly at an unconscious level – in the rich world of four-fold thinking. Cicero’s virtues and Aristotle’s enteleichia (causes) are members of the same (fourfold) stock. The final cause equates with wisdom, the formal cause with justice, the material cause with courage and the efficient cause with temperance. All this becomes evident in the fourth quarter of the Third Quadrant, not only in the Roman cultural presence, but in any communication. The Pantheon is probably one of the most outspoken ‘quadralectic’ buildings in the world. It is here, in the combination of a ‘classical’ square front and a round main building (rotunda), that the spirit of the two last quadrants, i.e. the Third and Fourth Quadrant, is caught in architectonic splendor (fig. 92). Fig. 92 – The Pantheon in Rome is seen here in a sketch by Fernando Partini (Florence, Museo dell’Opificio). Emperor Hadrian, who ruled the Empire from 117 – 130 AD, reconstructed the Pantheon between 118 and 128 AD. Two earlier temples on the same place were destroyed. The first one was built by Marcus Agrippa, the advisor of Augustus, around 27 BC and disappeared in the great fire of 80 AD. The second effort was made by Domitian, but burned again in 110 AD. 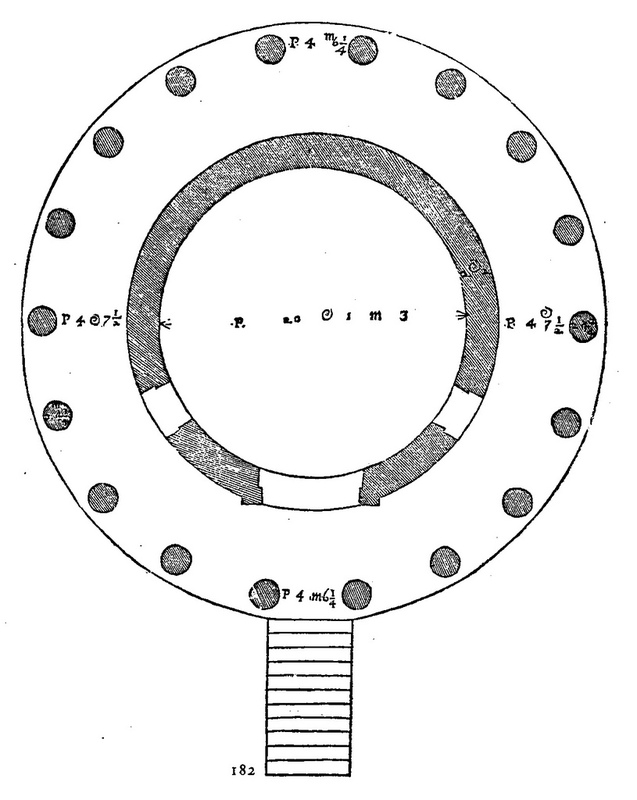 The building of Hadrian had an octastyle classical front and a cylindrical Rotunda. The cupola with the oculus is a point of unity, opening the interior to an unlimited exterior. The temple was initially built by Marcus Agrippa around 14 AD, but – according to Andrea Palladio (in his ‘I Quattro Libri dell’Architettura’, 1570; Book 4, Cap. 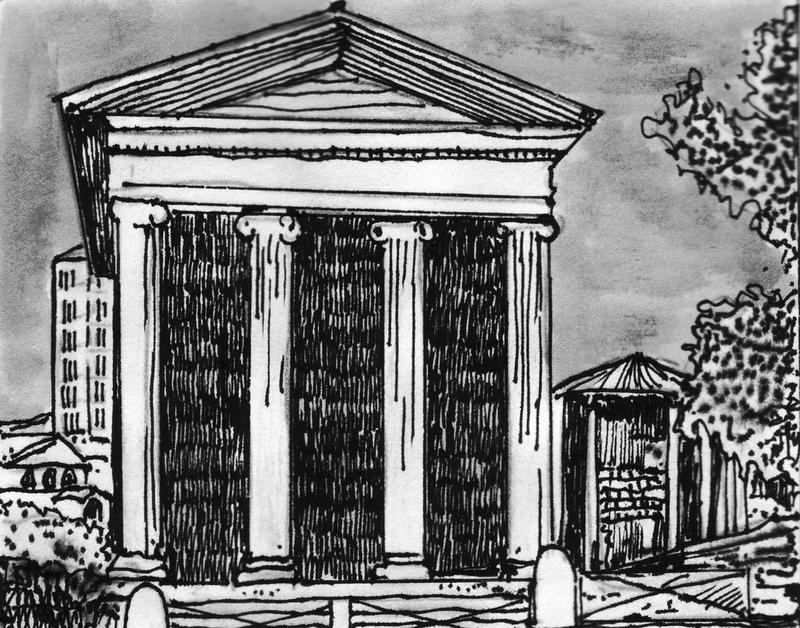 22) – he only erected the portico (porch). Nevertheless, the inscription on the frieze of the porch reads ‘M. Agrippa L. F. Cos. Tertium. Fecit’, dating from Hadrian’s times, and giving him all the credit. The inscription should be read as ‘Marcus Agrippa Luci filius Consul Tertium fecit’. It seemed that Emperor Hadrian never put his own name on any of the monuments he built. A further long text underneath the larger inscription explained that Emperor Marcus Aurelius and Septimius Severus restored the church after it was damaged. These emperors reigned respectively from 161 to 180 AD and from 193 to 210 AD and had less scruples to put their names down, while their contribution to the building seemed to be far less. The dome had a span of 43.2 meters and was the largest dome in the world until Brunelleschi’s dome of the Florence Cathedral (1420-1436) took that title. The dome of the Aya Sophia in Istanbul (535 AD), reached a span of forty meters. 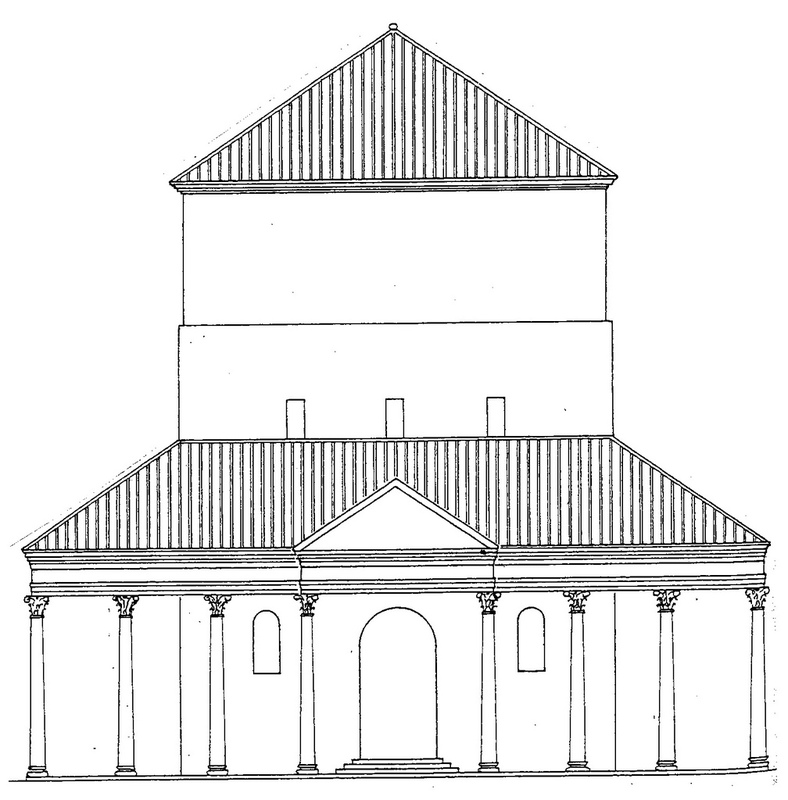 Palladio’s plan of the Pantheon, as once given in the Architettura, is still an accurate representation of the present situation (fig. 93). Fig. 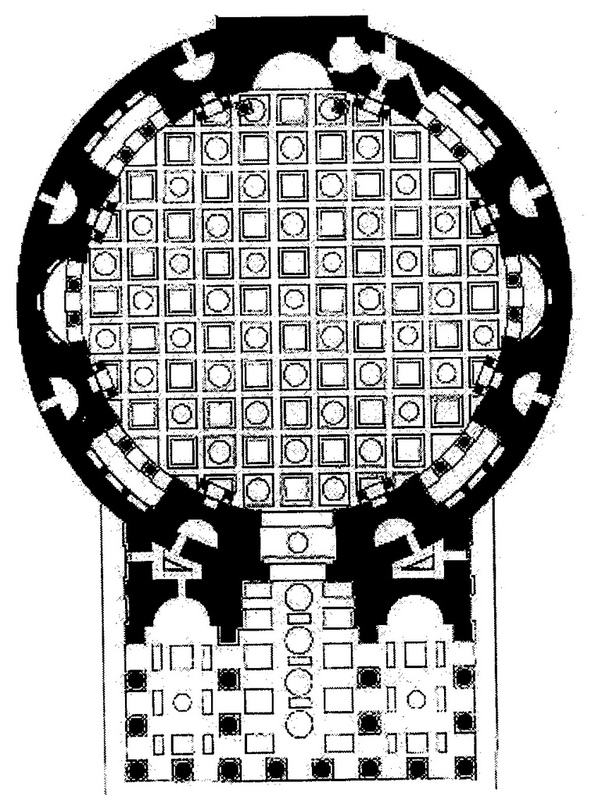 93 – A plan of the Pantheon in Rome. The building was called the Pantheon because it was dedicated to the twelve Olympian gods. The Roman Empire reached under Emperor Hadrian its finest hour as far as its (visible) visibility was concerned. The times of external and internal warfare seemed to be – at least for a while – a thing of the past and all energy could be focused on the building of great projects. Emperor (Hadrian) was a man, who understood the width of multiple division thinking. The style of his building pointed, in retrospect, to a mind absorbed by the possibilities of the four-fold and the importance of the circle and the square as symbolic expressions of a well-balanced, equal-minded approach to life and living. The Maritime Theatre, the Hospitalia (with tetradic mosaics) and the Small Temple of Venus in Hadrian Gardens in Tivoli and his cylindrical mausoleum at the Molvanian Bridge are some further examples of his sympathy for a ‘tetradic’ way of building (JACOBSON, 1986). It can be noticed, in hindsight and from a distant view in time, that the period around 125 AD – i.e. the boundary between the Third and the Fourth Quadrant (in a quadralectic interpretation) – marks the culmination of Roman tetradic thinking as it became visible in architecture. It would be worthwhile the study the history of the Roman Empire from the apparent dominance of various types of division thinking during its period of visibility. The findings can be projected, in a conscious move of mental inversion, on the development of a universal communication. The boundary between the Third and Fourth Quadrant, or the transition from the visible to the invisible visibility, would become a moment of phenomenal importance, where the presence of the four-fold reaches its zenith. The obelisk in front of the Pantheon was originally placed before the S. Marento, which is close to the S. Ignazio in 1551, but moved in 1711 to the present place on the Piazza della Rotonda. This square was about two to three times as big in the times when Hadrian initiated the reconstruction. 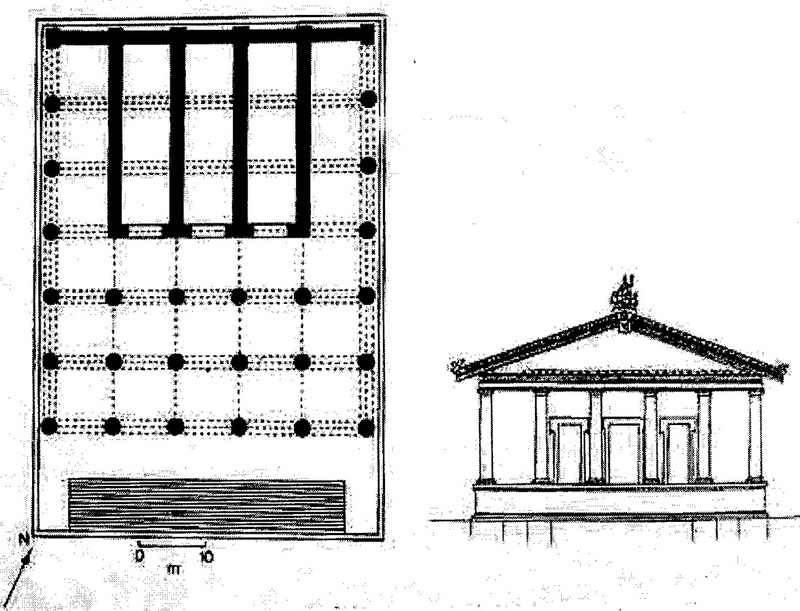 The original temple face was turned hundred-and-eighty degrees and the pronaos was situated on the place of the original temple building (RODDAZ, 2002; fig. 94). Fig. 94 – The Pantheon is seen here in its original context. A large esplanade is surrounded by a stoa-type of extension with a triumphal arch in the middle of the field (as given by RODDAZ, 2002). Two more round temples of the later period of the Roman Empire (third century AD) will conclude this limited survey of cyclic structures. Both architectonic plans, the first from the temple of Minerva Medica in Rome and the second from the Temple of Venus in Baalbek, departed from a strict cyclic idea and ventured into additional features. The Temple of Minerva Medica in Rome dates from around 250 AD. 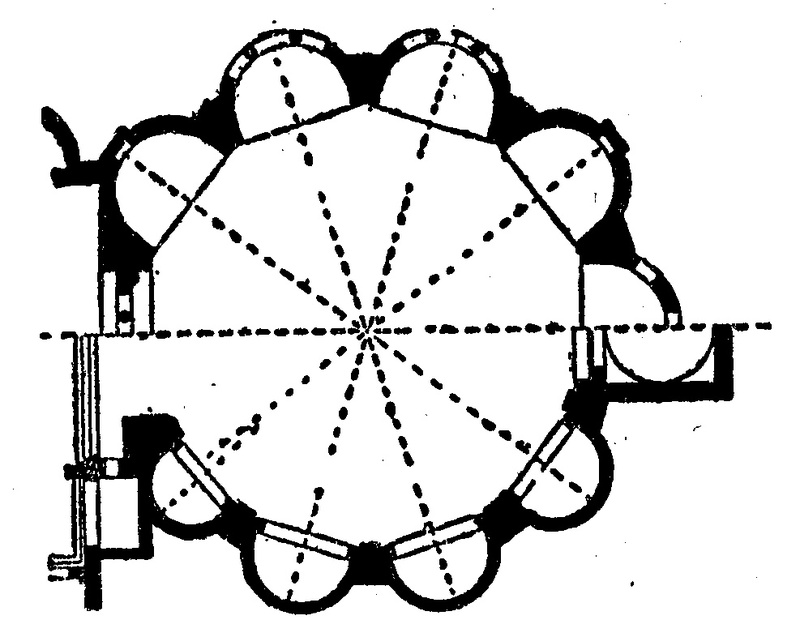 It combines the cyclic idea with a decagonal hall of opus latericium and was covered with a domed roof. Minerva (later equated with the Greek goddess Athena) was the Roman goddess of wisdom, medicine, the arts and war. She is believed to be the inventor of numbers and musical instruments. Other scholars dismiss the interpretation of a temple, which was essentially based on a statue of Minerva with a snake, found at the site long time ago. They define the building near the Via Labicana as a nymphaeum, probably belonging to a large bath establishment. It was also attributed to the Horti Liciniani, dating from the fourth century. The Temple of Minerva was partly used in the S. Peter’s, where Paul V converted a portion of its architrave into the high altar in 1606. Unfortunately, the vault collapsed in 1828. Before that time, it might have inspired many architects, including Michelozzo di Bartolommeo (1396 – 1472) and Filippo Brunelleschi (1377 – 1446), to follow this inspiring example (fig. 95). The dome remained throughout the history of (Christian) architecture as a symbol of unity. Fig. 95 – The cyclic ground plan leads to ideas about a polygonal infill of space. The upper half shows the so-called Temple of Minerva Medica in Rome (c. 250 AD), also interpreted as a nymphaeum (monumental fountain), built by Alexander Severus. The lower half gives the plan of Michelozzo’s rotunda at the east of the SS. Annunziata, Florence, begun in 1444. The Temple of Venus in Baalbek (Lebanon) is a small building (fifteen meters in width), which is situated next to the Acropolis, with the mighty Temple of Jupiter (60 – 70 AD) as the most important building (fig. 96). The complex in Baalbek, even in its present form, is still one of the great places of devotion and worship intermingled with the extraordinary human achievements in architecture and engineering. Fig. 96 – The religious complex in Baalbek as it might have looked in the third century AD. 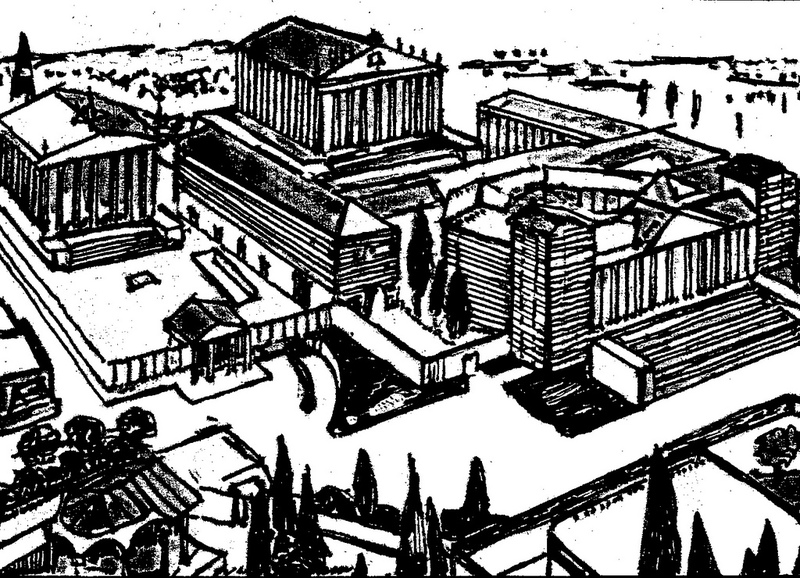 The Temple of Jupiter in the center had the Great Court in front and a Hexagonal Forecourt formed the connection with the Propylaea. To the left (south) is the Temple of Bacchus (or Mercury or Small Temple), which was constructed in the middle of the second century AD. In the left-hand corner (southeast) is the Temple of Venus (or Round Temple) con-structed in the early part of the third century AD. The ‘theme’ of a round temple, dedicated to the goddess of love and beauty, found its inspiration in the fourth century BC in the temple of Venus (Aphrodite) at Cnidos, one of the six Dorian colonies in Asia Minor. The city of Cnidos was established at about the same time as Halicarnassus, in the southern part of Ionia, which was earlier (p. 121) mentioned as a place of special attention to the four-fold. The statue of Aphrodite of Cnidos was made by the sculptor Praxiteles around 360 BC and once stood in the middle of the round temple at Cnidos. The temple offered a view to its two harbours, one to the Mediterranean and one to the Aegean Sea. The arcaded way was built of white marble heart-shaped columns. Emperor Hadrian (around 125 AD) used the cyclic plan in his Small Temple of Venus in Hadrian’s Villa in Tivoli and also copied the before-mentioned sculpture of Praxiteles’ ‘first universal blond’ (Joanne Pitman). A marble copy of the ‘Aphrodite of Cnidos’ is now in the Vatican Museum, Rome. The Temple of Venus in Baalbek (Lebanon) got its name from the shells and doves, which decorated the external niches. The round building (with an ‘Ionic’ type of extension to the northwestern side) dated from the first part of the third century AD and was a remarkable piece of late Roman architecture. The sanctuary was during the Christian times devoted to Saint Barbe, which is still the saint of Baalbek. While we are at this location (the Baalbek complex) it is interesting to note the three megaliths (the ‘Trilithon’), which were incorporated in the walls of the Great Platform. Each of them had a length of around twenty meters and weighing some eight hundred tons. Some nine more blocks are in the order of four hundred ton each. 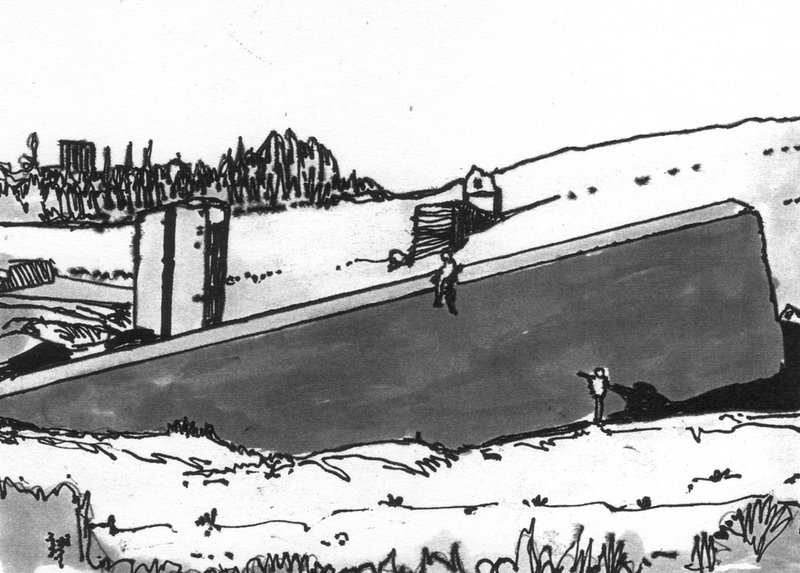 A fourth megalith is still lying in a nearby quarry about half a mile away and weights nearly twelve hundred tonnes. Its name is Hajar El-Hibla (Stone of the Pregnant Woman)(fig. 97). Fig. 97 – This drawing depicts the ‘Stone of the Pregnant Woman’ (Hajar El-Hibla), some twelve-hundred tonnes in weight, still lying in a quarry near the religious complex of Baalbek. 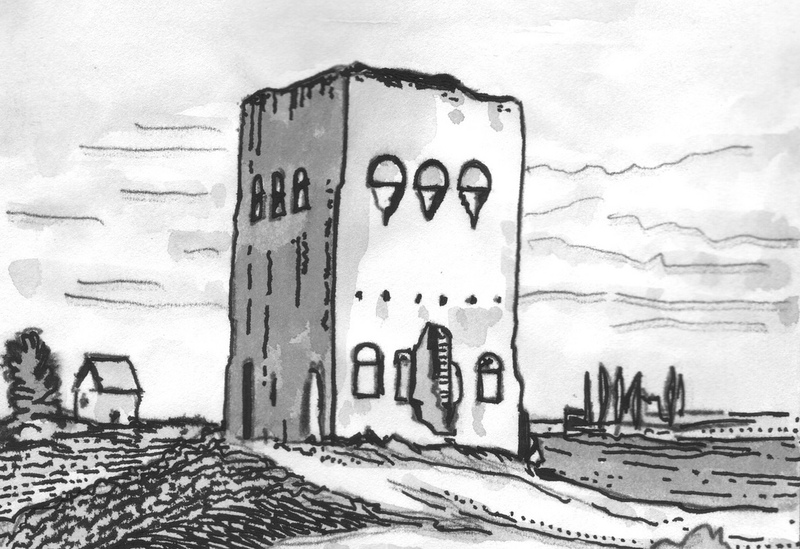 The presence of the megalith could mark the very moment when a megalomaniac Roman building project came to a halt. In this view, the cyclopean stone was prepared for the extension of the Great Platform of the Temple of Jupiter, but the project was abandoned after technical or financial difficulties. However, the suggestion has also been made (by Ernest Renan in the nineteenth century) that these enormous blocks predate the building of the temple (between 60 and 70 AD) by some thousand years and belong to a much older (Phoenician?) culture of master builders. In that case, the unfinished megalith was part of some earlier engineering defeat. The location and state of work in Baalbek has a resemblance to the Unfinished Obelisk in the granite quarries of ancient Aswan (Egypt). However, this latter project was abandoned because a large crack made it unfit to become an obelisk (of estimated forty meters high and a weight of 1185 tons). In the case of the Stone of the Pregnant Woman there is no crack – although recent ‘preservation work’ resulted in a large chunk of the rock being broken off – and there is no obvious sign why the quarrying was stopped. So why was the project abandoned in Baalbek? The presence of the unfinished cyclopean stone might indicate the arrest of one of the great feats of Roman engineering, because the technical possibilities to transport and raise these stones proved to be insufficient. Alternatively, lack of money and/or manpower might be the reason to abandon the work. Another possibility is the suggestion, as already put forward by the French archaeologist Ernest Renan in the mid-nineteenth century, that the stones were much older than the rest of the temple complex and that the Romans inherited some major engineering defeat from the past. Some interesting speculations will not be made here. The round, tholos-type temple, of which some examples are mentioned here, formed a small, but significant minority within the Roman cultural presence. A reference to a higher and more balanced way of thinking cannot be excluded. Most Roman temples, however, were designed in a rectangular fashion, following the great examples of the Greek architecture. The various types of arrangements of the pillars (and their shape and numbers) found an echo in the Roman architecture. The conclusions for the Roman cultural period with regards to temple building and division thinking are similar to the Greek cultural period. There seems to be, in most cases, no evidence for a direct link between a particular numerological consciousness and its rendering in marble and stone – other than an awareness of the multitude. The most visible period of temple building (in the Third Quadrant) is also the time of oppositional and materialistic thinking. One of the most important rectangular temples in Rome was the one dedicated to Jupiter Capitolinus, situated at the Capitol Hill in Rome and built in 509 BC. (fig. 98). Fig. 98 – The plan and hexastyle front of the Temple of Jupiter Capitolinus in Rome. The number of columns (6 x 7) only points to the multitude. The quadriga on top – and its reference to the four-fold – might be an artistic addition. Jupiter (Jove) was the upper or supreme god of the Roman pantheon and recognized as father of the gods in the same way as Zeus. He was a sky-god and a light-bringer, but also associated with rain and thunder. His sanctuary on the Capitoline Hill (and on many other elevated places in Italy, like the Capitolium in Ostia, built in Hadrian times) was built as a protector against the freak outbreaks of nature. Jupiter was a protective deity, but also guarded the public morality. Traitors were thrown from the Tarpeian rock on Capitoline Hill if they did not behave in a socially and lawful way. The association with fire/light and his presence as the Lord of Heaven would place Jupiter in a modern interpretation in the First Quadrant. He was thought to determine the course of human affairs, and he would make the future known through signs in the heaven and the flights of birds. A Roman coin struck in 76 AD, which showed on one side the laureate head of Emperor Vespasian and on the reverse side the hexastyle temple of Jupiter Capitolinus. The latter has statutes of Minerva, Jupiter and Juno, between the columns. The so-called Capitoline triad (see p. 125) points to a three-division and a psychological setting, which caters for the intellectual handling of the oppositional forces (by creating an intermediate position). However, it also results in a form of power play, which can be part of such mental dynamism. The Trinity (Father, Son and Holy Ghost) in the Christian belief has exactly the same effect. The Temple of Portunus (formerly known as the Temple of Fortuna Virilis) is one of the more tetradic-orientated and older temples in Rome (100 BC). This small temple on the banks of the Tiber, close to the Temple of Vesta on the Forum Boarium (fig. 90), represented a merging of the Etruscan and Greek temple styles (fig. 99). Portunus’ temple is several decades younger than the nearby Temple of Vesta. The former features tetrastyle columns, while the latter is circularity. Fig. 99 – The Temple of Portunus, formerly known as the Temple of Fortuna Virilis, is situated on the Forum Boarium near the Tiber. The prostylos temple, with Ionic columns (4 x 7), was built at the beginning of the first century BC. To the right is the circular Temple of Vesta partly visible and to the left the bell tower of the Church of S. Maria in Cosmedin, restored by Pope Clemens XI. 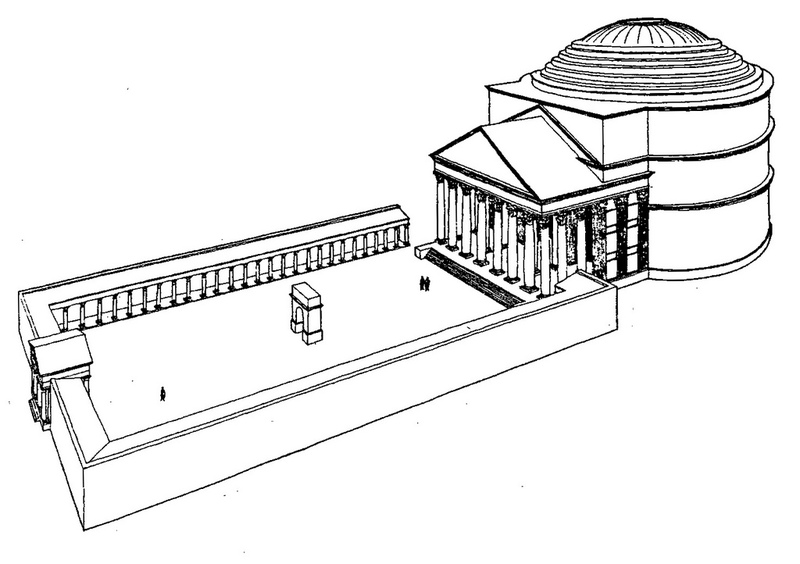 The position of these two temples in the Roman cultural history (fig. 88) can be pinpointed in the third part of the Third Quadrant, i.e. in the most oppositional transfiguration of the specter. Therefore, the use of the four-fold (as an idea) might well be used as a reaction against the two-fold spirit of the times. Similar ‘revolutionary’ use of the tetradic symbolism and imagery can be seen in the oppositional environment of the sixteenth century of the European cultural history in the architectonic styles of the Late Renaissance and Mannerism. A rather famous Roman temple, dating from the early first century AD, is the Temple of Gaius and Lucius, which is better known as the Maison Carrée in Nimes (Southern France). The date of construction of this temple has been subject to scientific questioning by James C. ANDERSON (2001), who noted an anachronism in the architecture of Gaul. This ‘Square House’ is a hexastyle temple (6 x 11 columns) with little references to the four-fold. Andrea Palladio gave in his book ‘I Quattro Libri dell’Architettura’ (1570) a tetradic decoration in ‘another temple in Nimes’, not the Maison Carrée (fig. 100). Fig. 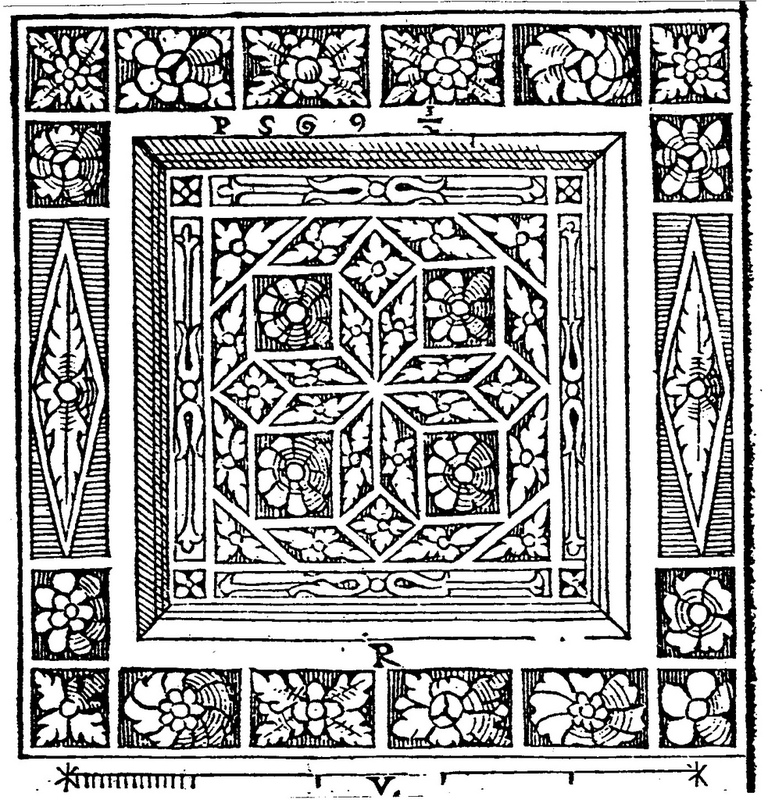 100 – Andrea Palladio gave this decoration in his famoud book ‘I Quattro Libri dell’Architettura’ (1570). The indication of its original location in ‘another temple in Nimes, not the ‘Maison Carrée’ is enigmatic. The illustration showed Palladio’s sympathy for such patterns (in the sixteenth century of Europe’s cultural history), but he did not express a numerological preference throughout his book on architecture. In fact, just underneath the given decoration is another one with a hexagonal shape (within a circle). Palladio’s interest in classical temples includes many ‘tetradic’ examples. 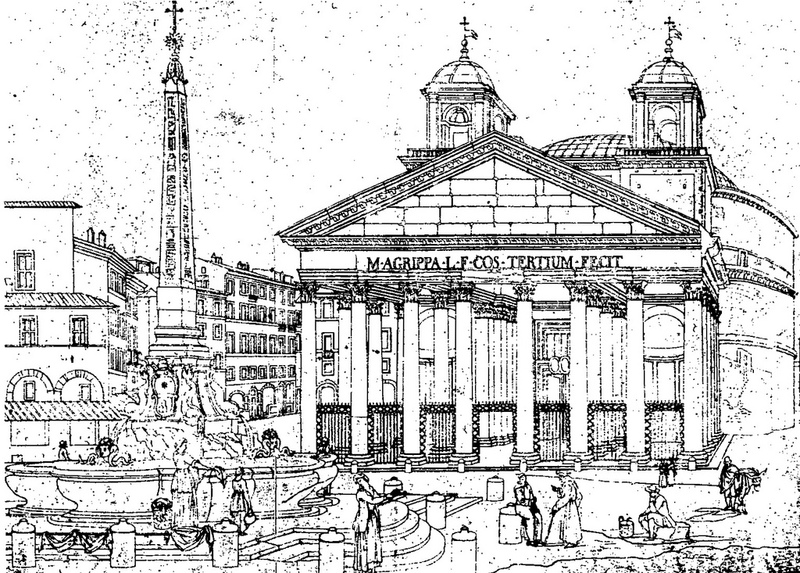 He gave such illustrations as the Temple of Fortuna Virilis, the Temple of Vesta (Rome), the Baptistery of Constantine, the Pantheon (Rotonda), the Temple of Vesta (Tivoli) and tetrastyle temple at Pola (Istria). There is, on the other hand, an equal number of ‘non-tetradic’ temples in his repertoire. The Temple of Jupiter, the Temple of Mars Ultor, the Temple of Nerva Trajanus, Sol and Luna and Castor and Pollux in Naples and the Maison Carrée and ‘another temple in Nimes’ qualified for such a status. Palladio did not seem to have any preference for a certain number. 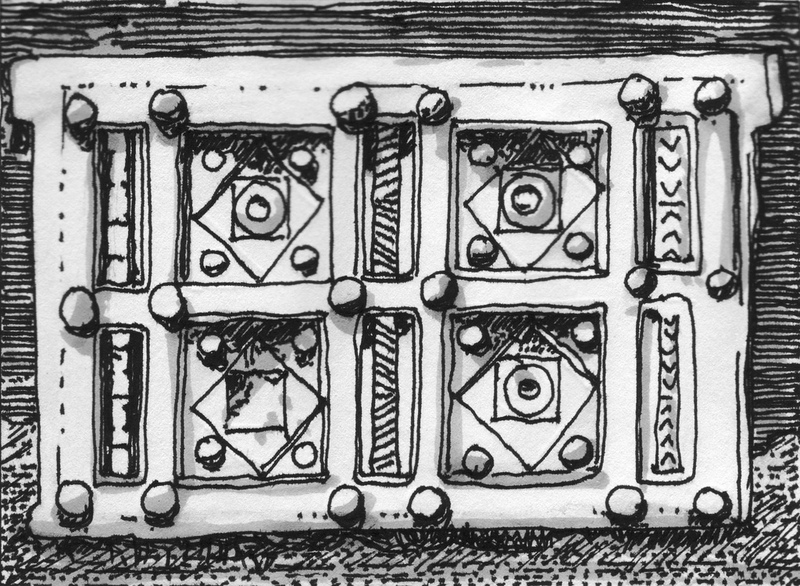 The Gallo-Roman Umgangstempel, which had a widespread distribution in the western and central part of Europe (fig. 101), is a good example of tetradic inspired building. Its roots can be found in the Celtic heartlands of Europe, but its great popularity was found in the Roman Empire. They occur as far north as Elst (The Netherlands) (PETERSE, 2005). Many are found in England. Notably absent is their presence in Ireland. Most temples were built in the second half of the first century AD, i.e. in the fourth part of the Third Quadrant of the Roman cultural period (see fig. 88). The influence of the approaching Fourth Quadrant (starting in AD 125) might have been reflected in the architecture of the temples. Fig. 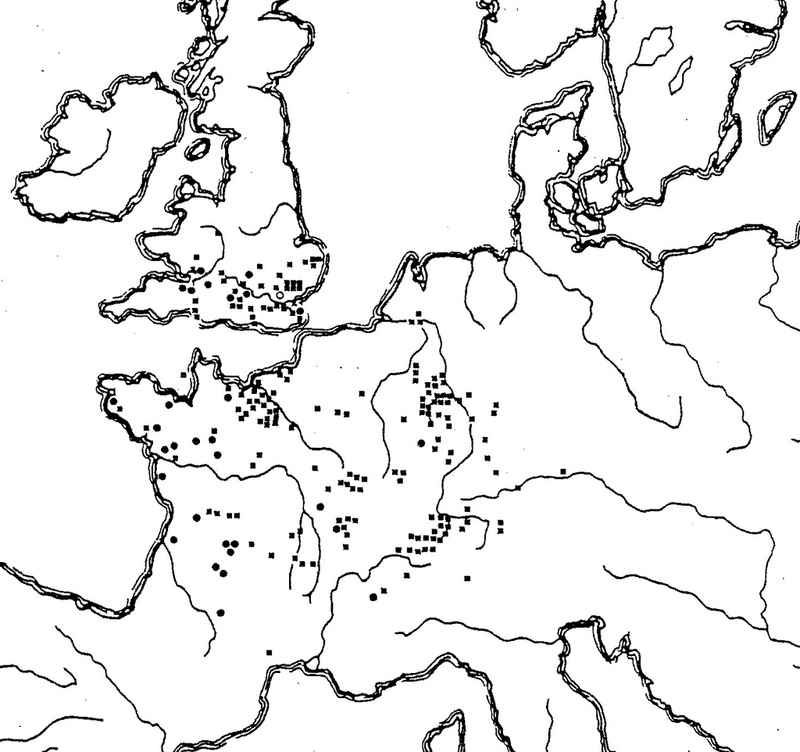 101 – The widespread occurrence of the Gallo-Roman ‘Umgangstempel’ in Central and Western Europe is seen here on a map by Günther WIELANDS (1999). The ruins of the cella of the Janus temple in Autun (Burgundy, France) are visible as a tower-like structure (fig. 102). The original building comprised a gallery with columns surrounding the central part. A reconstruction of this temple (by J.J. Rach) is given in fig. 103. Fig. 102 – The remaining central part of the Temple of Janus in Autun as seen by Edme Thomas (1856) in ‘La cité antique d’Autun’. Fig. 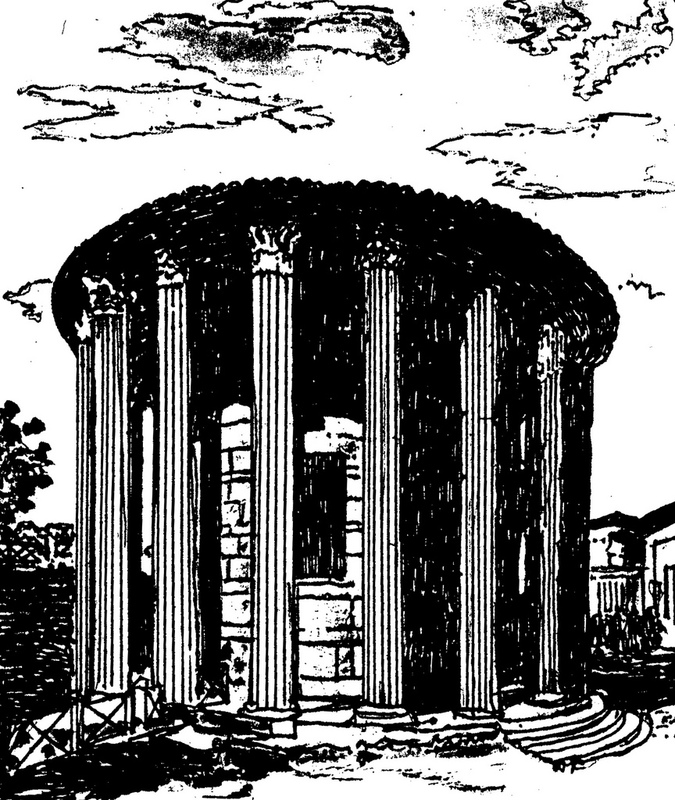 103 – A reconstruction of the Janus Temple at Autun by J.J. Rach. 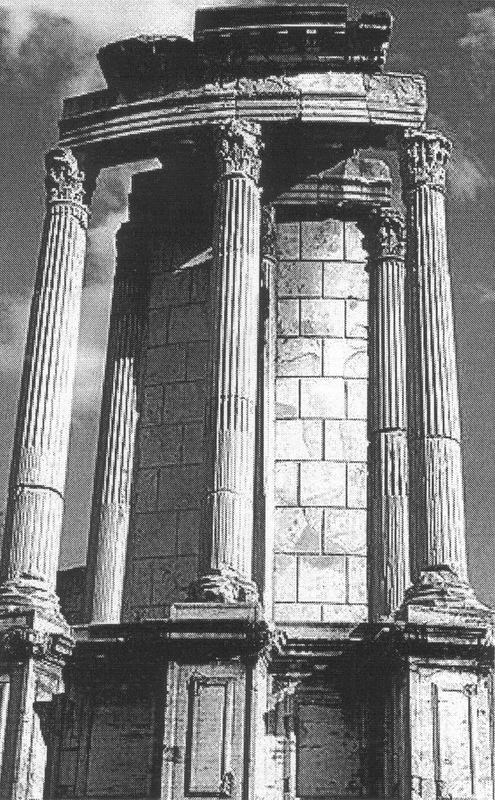 The symbolism of (temporal) cyclicity in the Temple of Janus (in Autun) was expressed in the portes solsticiales. The longest day on the Northern Hemisphere (24th of June) was devoted to Saint John the Baptist. The shortest day – the solstice of winter – was dedicated to John the Evangelist. Janus was the Roman god of gates and doors (Ianua) and transition. He stood as a symbol for all beginnings and endings, like the beginning of the harvest, marriage, birth and other important events in life. The double-faced head of Janus pointed to duality and opposition. However, there was a tendency in the Roman cultural history – as stated earlier – to a four-fold direction (Janus quadrifons). The story of Roman temples has to come to a close here, even if it is felt that not enough attention is given to some of its developments. This short eclectic survey shows the same enigmatic character as the Greek temples as far as its prime intentions are concerned. A certain number of round temples – a minority – could point to a cyclic state of mind. The majority, however, consists of rectangular temples scattered over the Empire, suggesting a square inclination. An imposing building like the Temple of Bacchus in Baalbek (Libanon), dedicated to Venus/Astarte, is just – from the outside – a compact mass of stone surrounded by a forest of pillars. Forty-two Corinthian columns in total of which nineteen are still standing. The message is clear enough: this building is an unbounded dedication to the strength of quantity. This celebration in itself, including its disdain for an ostentatious showing of any particular type of number symbolism, fits into the mind of an architect living in the Fourth Quadrant of a cultural presence. The Temple of Baal at Palmyra (Syria) followed that same path, although much more has been damaged and only the inner temple still remains. Amidst the exuberance of building in the second century AD is the so-called ‘Palmyra-door’, a splendid tetradic architectural feature (fig. 104). Fig. 104 – This exemplar of a ‘Palmyra door’ is a fine specimen of tetradic architecture. The stone door is lying on its side in the garden of the National Museum in Damascus with the ‘hinges’ at the upper side. Inside the Museum is an excellent reconstruction of a Palmyra room, which features a door in its upright position (and a collection of sculptures of high-ranking families, with remarkable ‘decadent’ faces). Much work has still to be done in the investigation of tetradic influences in Roman temple building. It is hoped for that these preliminary considerations will give the inspiration for further scientific exploration in this direction.